For nearly a quarter of a century, Corporate and Governmental Deviance has offered students the most comprehensive examination of the deviant behavior of big business and big government in contemporary society. Now in its sixth edition, this popular and well-respected collection has been thoroughly updated. It features an expanded and insightful introductory essay by the editors that illustrates the issues discussed in the text and establishes a clear framework for the sections that follow. New selections focus on college sports' crippling effect on undergraduate education; the ordinary obedience of a South African police officer and apartheid torturer; and the Los Angeles police department Rampart Division scandal. Also included is new scholarship on the Ford Motor Company Pinto episode and the Challenger Space Shuttle disaster. This new edition reprints classic works from the scholars who first established and explored corporate and governmental deviance, featuring essays by Edward Alsworth Ross, Edwin H. Sutherland, Marshall B. Clinard, Peter C. Yeager, and James S. Coleman. It also retains selections that have captured the attention and imagination of readers of previous editions, exposing students to the very best classic and contemporary material on corporate and governmental deviance. Offering a complete description and careful analysis of the deviant actions of business organizations and governmental agencies, Corporate and Governmental Deviance, 6/e, is intended for courses in sociology, criminal justice, white-collar crime, and business, as well as for courses that focus on social problems, organizations, deviance, and government. 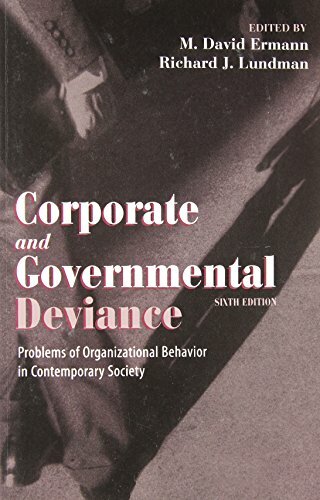 It continues to set the standard by which other books on corporate and governmental deviance are judged, providing students with an even more complete, richly detailed appreciation of how and why organizations, not just individuals, commit acts of deviance.